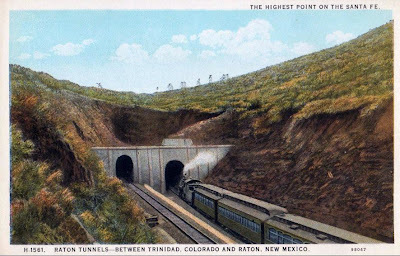 On the New Mexico / Colorado state line the north portal to the Raton Pass tunnel at 7,588 ft (2,312 metres) was the highest point on the old Santa Fe Railway. The the line is still owned by BNSF, however, as it has easier alternative routes the dearth of freight customers on the line now means that the route is only used by the Amtrak Southwest Chief. And the continuation of that situation is in doubt: although both Amtrak and BNSF want the train to stay on its present route from Lamy New Mexico, to Trinidad, Colorado, over Raton, neither is willing to pay the full cost of maintaining the line and have looked to the states of New Mexico, Colorado and Kansas to pay $100 million towards it - but the Departments of Transportation in those states say they don't have the money.